The Company Pastificio Cirigliano has been producing pasta for over 30 years. The company's mission is to provide its customers and consumers with the highest possible quality and food safety standards. This goal is achieved thanks to the selection of the finest raw materials, starting from the durum wheat semolina from the nearby Puglia region, and the fresh eggs from the best Northern Italy farms, that grant pasta the elasticity necessary to delight our palate. The company uses traditional production systems such as bronze dyes and slow drying process. 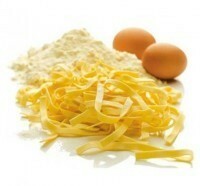 All of our products are pasteurized at 95/100 ° during processing and this allows pasta to last longer.